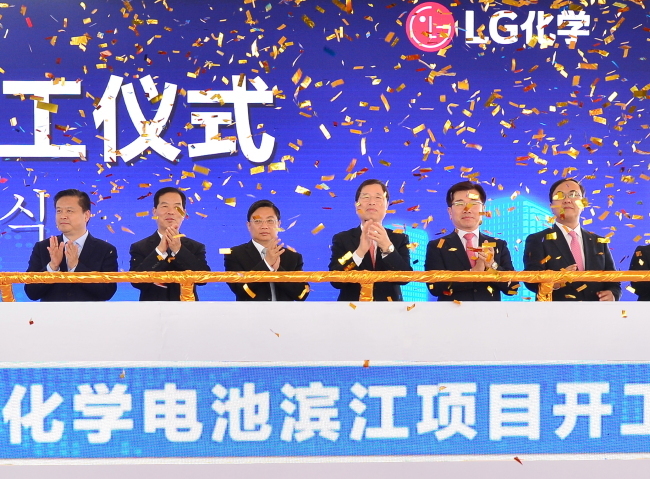 LG Chem broke ground for an electric vehicle battery plant in Nanjing, China, its second EV battery production facility, to aggressively expand into the Chinese market, the company announced Tuesday. The new three-story factory will be built on a 200,000 square meter plot in the Binjiang Economic Development Zone, with a plan to start operations late next year. The company will inject a total of 2.1 trillion won ($1.9 billion) into the new facility by 2023 with an aim to secure an annual capacity of producing cells for more than 500,000 high-performance EVs that can drive 320 kilometers on a single charge. The second factory is expected to take advantage of its geographical location, being just 45 kilometers away from the company’s first EV battery plant in the country. It is also located just 180 kilometers from Wuxi, where LG Chem is producing cathodes with its Chinese partner Huayou Cobalt. Attended by Chinese government officials, the Korean firm held a groundbreaking ceremony at the construction site. With the Nanjing plant, LG Chem will be producing EV cells at a total of five production sites in China, Korea, Poland and the United States. By 2020, the company plans to have the capacity to supply enough batteries for over 1.5 million electric vehicles. According to market researcher SNE Research, the global EV market is forecast to grow from 6.1 million in 2019 to 22 million by 2025, accounting for 21 percent of the total automobile market.